Since the beginning of the 20th century open air schools have been built to help physically weak children gain strength aided by sun and fresh air. In 1927 Duiker and Bijvoet were commissioned to design such a school in Amsterdam-South. Standing on the inner court of a perimeter block, it was preceded by five preliminary plans for various locations. The school consists of a square classroom block in four levels placed diagonally on the site. This basic square is subdivided into four quadrants around a diagonal central staircase. East and west quadrants each contain one classroom per storey and share an open air classroom on the south side. The north quadrant occupies the ground floor only and comprises a staffroom. Also on the ground floor are a classroom in the west quadrant, the main entrance below the open air classrooms and an oblong gymnasium, sunken to accommodate its extra height and half tucked in under the classroom block. The concrete columns are situated not at the corners but in the middle of the quadrants' sides, producing a favourable distribution of forces in the facade beams, keeping the corners free of columns and strengthening the school's open, 'floating' appearance. Floor slabs cantilever over the main beams resulting in a counterbalance of moment. The columns are further coupled diagonally by secondary beams which express in the ceiling the diagonal spatial composition of the classrooms. The structure's distribution of forces is demonstrated by tapers in the columns and beams. Except for a low concrete parapet the facades are fully glazed and fitted with steel-framed pivoted windows allowing classrooms to be opened up entirely. The concrete floor slabs contain central heating pipes on the underside, fitted during the pouring process. This system of heating from the ceiling down, chosen so as to be able to open the windows in winter, was only moderately successful and was replaced in 1955. Characteristic of Duiker's conscientious attention to detail are the coat pegs attached to the central heating pipes in the hall. 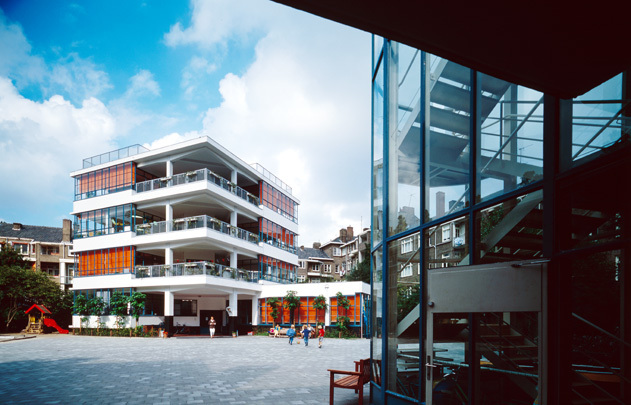 The gateway building on Cliostraat consists of a housing block to the right of the gateway and an infants' classroom above a cycle shelter and the entrance. This building, being relatively low and transparent, allows a satisfactory view of the school from the street. In 1985 the gateway building underwent an exemplary restoration by J.M. Peeters and was extended with a new stair. In the Open Air School the ideals of Modern Architecture, light, air and space have been attained in no uncertain fashion. It joins Duiker's Zonnestraal in Hilversum and Van der Vlugt's Van Nelle factory in Rotterdam as one of the masterpieces of this type of architecture in the Netherlands.